In the simplest terms, our story begins over 50 million years ago with a single species of bird. This bird looked nothing like a meadowlark or a longclaw; those were still millions of years in the future. This one species spread out across a wide geographic area and many habitats. 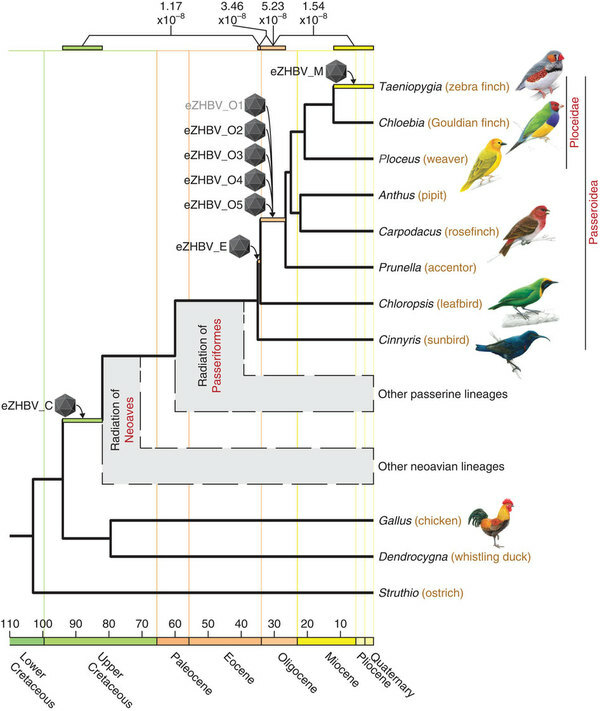 It evolved, through classic divergent evolution, into many separate species, eventually spawning finches, flycatchers, weavers, pipits, sparrows, warblers, thrushes, tanagers, vireos, and many more. 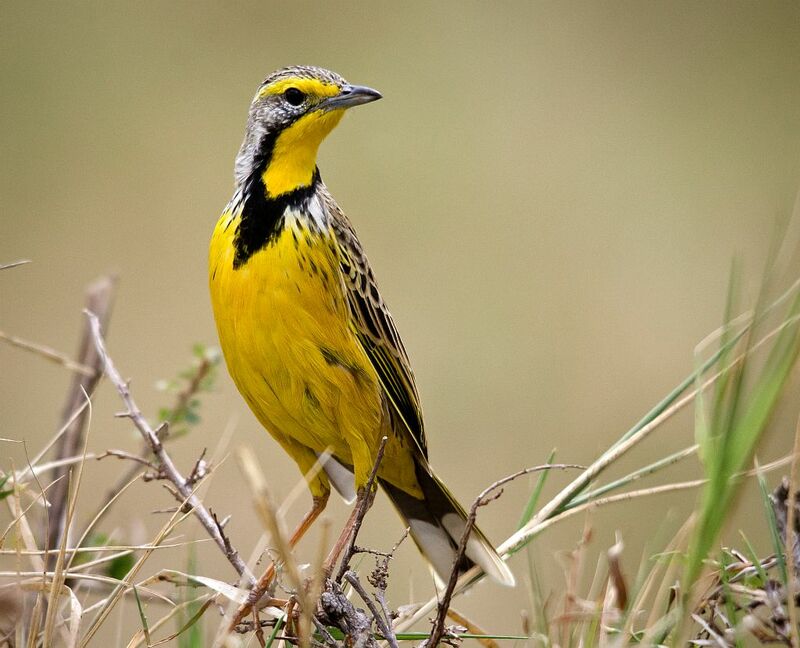 Millions of years later, meadowlarks (related to blackbirds and orioles) appeared in the New World . In the Old World, longclaws (related to pipits) were born. In one of the most famous examples of convergent evolution, these two species, distant cousins millions of generations removed, were nearly identical. 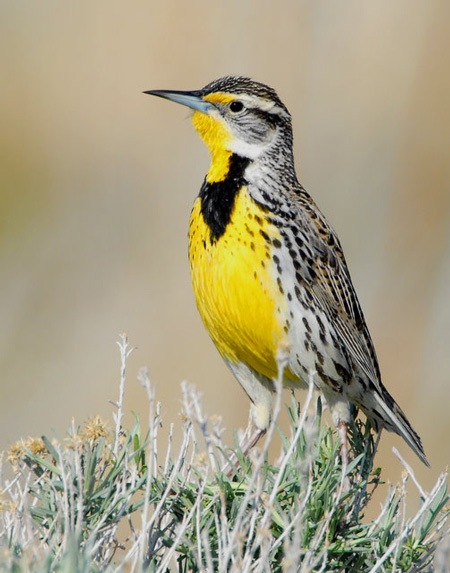 In fact, the Eastern and Western Meadowlarks of North America are so similar to the Cape and Yellow-throated Longclaws of Africa that Linnaeus first thought they were the same species. In addition to their nearly identical plumages, they both forage for insects on the ground in relatively low open grass, sing from low but prominent perches, walk methodically on the ground when foraging, and fly with short wing bursts interspersed with glides. A comment in Wikipedia borders on the absurd, but highlights the prevailing view in science that evolution is largely random: “As this exact pattern provides no obvious adaptive benefit compared to that of other meadowlarks and longclaws, it seems to have arisen twice by sheer chance.” This quantity of nearly identical characteristics, clearly filling the same ecological role, suggests that something greater than sheer chance is at work. Obviously, there is something about this pattern, the yellow underparts, the black “V”, the streaked back (clearly camouflage in the grass), the unique flight style, perhaps even the yellow eyebrow, that does provide an adaptive benefit. We just don’t understand what it is. Regardless, it is apparent that these species are following some rule that is causing them to converge to the same shape, color, and habits. From an American perspective, it appears that meadowlarks have evolved independently on another continent, filling the exact same niche in similar habitat. This niche, low open grassland, calls for meadowlarks! If the meadowlark/longclaw convergence were the only one, “sheer chance” would be a reasonable explanation. But the coincidences don’t stop with these species. Sticking just to grassland songbirds that forage on the ground in low open grass and sing from prominent perches, the “rule” has more to it. Yellow may be substituted with red (but rarely orange). 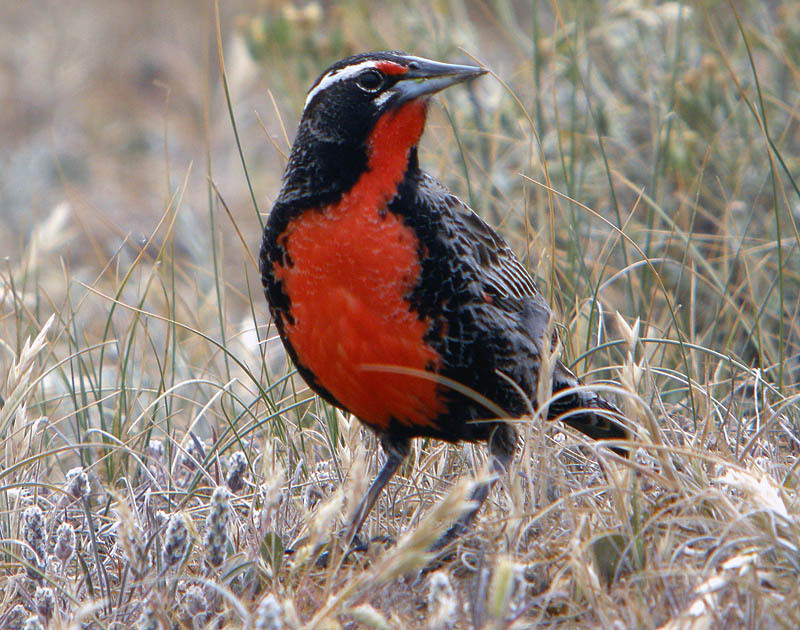 Research suggests that red evolved more recently in meadowlarks and blackbirds; they all started with yellow. 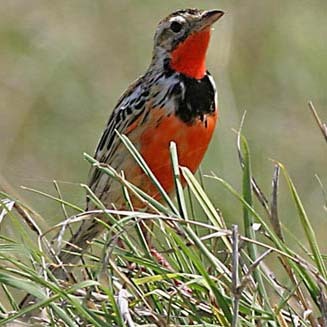 Red versions of the meadowlark/longclaw convergence are the Long-tailed Meadowlark of South America and the Rosy-throated Longclaw of Africa. While the underparts are brightly marked, the upperparts are camouflaged with the grass. Another bird that fits this grassland color pattern is the Dickcissel of weedy fields of the Americas, with its black “V” on the breast and yellow face. While the sexes are similar with meadowlarks and longclaws, the female Dickcissel is a faded version of the male, lacking the black “V”. Most of these birds have silver or metallic colored bills as well. Black “V’s” or “U’s” also occur on the breasts of some plovers, wagtails, thrushes, wheatears, flickers, scrub-jays, and McCown’s Longspur, to name a few. They are all species that spend some (or a lot of) time on the ground. Skulking grassland birds, like the grasshopper sparrow and grasshopper warbler, follow other rules that will be explored later. As we move into deeper cover, such as tall grass or tules where birds cling to long waving stems, we encounter a slightly different niche and a modified rule. Black, yellow, and red remain our primary colors. In this habitat, the conspicuous birds are sexually dimorphic, the males more gaudy, nearly entirely black and yellow (or red), while the females are more cryptic, often streaked like the meadowlark above, but without the bright colors below. Research suggests these females started colorful and evolved their camouflage later. We still keep pale or metallic bills for most species. Examples include several blackbird species and the Bobolink in the Americas (all related to meadowlarks), the widowbirds and bishops of Africa (related to weavers), and even the Red-backed Fairy-wren of Australia. The female Bobolink (below) is nearly identical to a female bishop, and behaves in the same way in similar habitat. The males have black underparts (rare in birds), pale backs, and sport a yellow (or orange or red) back of head and nape and flare their back and nape feathers when singing. 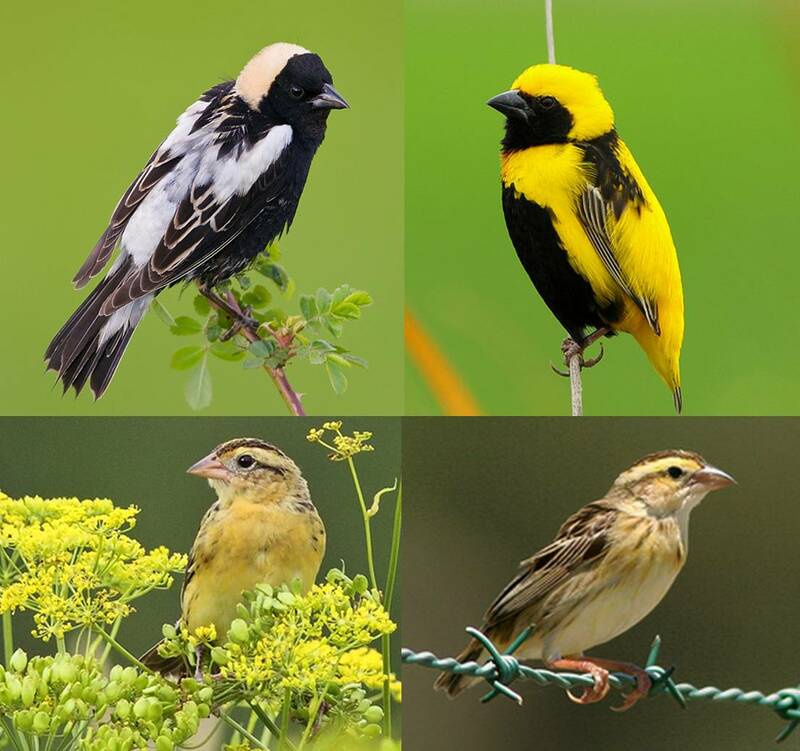 Check out the Bobolink singing and compare with the unrelated Yellow-crowned Bishop. The fairy-wren can also puff out the red feathers on its back. In several species on both continents, not at all related to each other, the males are black with red shoulders (with a pale border), and give showy display flights over wetlands. 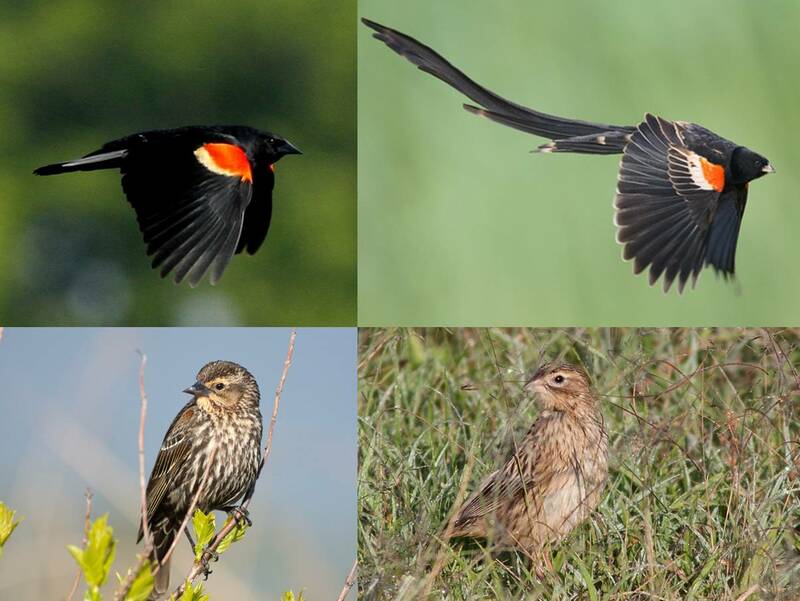 From an American perspective, it appears that swampy meadows demand Red-winged Blackbirds, even if it is the completely unrelated African widowbird version. Again the females are camouflaged. Female widowbird species present just as much of an identification challenge in Africa as do Tricolored and Red-winged Blackbirds females in the US. Skulking marsh birds, like the Marsh Wren and Zitting Cisticola, follow another rule that will be examined later. In the examples above, we have meadowlarks, blackbirds, and Bobolinks in the Americas (all Icterids); longclaws (pipits), widowbirds, and bishops (both weavers) in Africa; and the fairy-bird in Australia. The last time these all had a common ancestor was over 50 million years ago. See the chart below, with the timeline along the bottom (in millions of years). Weavers and pipits are identified on the chart. Icterids and fairy-wrens fall in with “other passerine lineages”. By this time, there was an Atlantic Ocean (of sorts) and the Americas and Africa were separate. These species evolved independently, converging upon their remarkably similar patterns in their respective habitats, presumably filling ecologically equivalent roles. This entry was posted in example: birds and tagged bishop, bobolink, convergent evolution, habitat niche, longclaw, meadowlark, widowbird. Bookmark the permalink. Agreed. I’ve removed it from this page and will add it to a discussion of black-bellied open country birds. Thanks! I have a long list of more such pages which I hope to add in the coming months. Did you have compared songs?? I am surprise to heard MArsh Wren and acrocephalus birds with very similar song. or Sicalis and cisticola juncundis with a very similar calls and habitat..